With each passing month, driverless cars make new advances. Within five years I believe driverless vehicles of all sorts will be common, albeit perhaps not the norm. Robotics Trends reports Driverless Car Completes Historic Cross-Country Trip. It’s official: Delphi Automotive’s self-driving car completed it’s 3,500-mile trip from San Francisco, California to New York, setting the North American record for longest drive ever by a driverless car. Delphi’s self-driving car, which is modeled after a 2014 Audi SQ5 and debuted at CES 2015, features six long-range radars, four short-range radars, three vision-based cameras, six lidars, a localization system, intelligent software algorithms and a full suite of Advanced Drive Assistance Systems. The car can manage four-way stops, merge onto highways, and steer around unexpected presences in the roadway, such as a bicyclist. Delphi has a series of videos for each major destination at Delphi Drive. As self-driving car tests begin in the UK, the government is looking to change some of the rules of the road. Please consider UK Rewriting Traffic Laws as Tests Begin. Britain is re-writing its traffic laws to stop self-driving vehicles from causing gridlock and to help them deal with aggressive human drivers. According to the Daily Mail, one of the major changes will allow cars to drive closer together “with separation gaps between automated vehicles just a fraction of the recommend spaces between automated vehicles compared to those with drivers.” The goal is to prevent self-driving cars from lingering before changing lanes, merging into an intersection or trying to claim a parking spot. The UK’s Department of Transport will publish this Spring a code of practice that will outline changes that need to be made to the Highway Code. This will be followed by a full review of legislation in 2017. “Driverless vehicle technology has the potential to be a real game-changer on the UK’s roads, altering the face of motoring in the most fundamental of ways and delivering major benefits for road safety, social inclusion, emissions and congestion,” says transport minister Claire Perry. The new laws may also legalize tailgating to enable driverless cars to improve fuel efficiency. These changes are being made, among other reasons, because self-driving cars can pass each other and change lanes with greater precision. Regulations about distance between cyclists and pedestrians may also be changed, as there’s a worry self-driving cars will be stuck for miles because they’ll wait to have enough space to pass. “If everyone obeyed exactly what it said in the Highways Code, the roads would probably grind to a halt,” Graham Parkhurst, head of an academic research program in Bristol, UK, recently told the Telegraph. Great Britain's test of the LUTZ is essentially a joke compared to the cross-country trip of Delphi. The LUTZ tops out at a pathetic 15 MPH and carries only two people. Here is a video of the LUTZ in action. The important point is the UK is considering traffic laws early in the game. People email me all the time about how they will never give up driving. Well, they will because eventually cars will not have steering wheels. I suspect that could happen within 15 years or so. I happen to like to drive as well, but one look at the Mercedes Benz F015 has me ready to do just that. 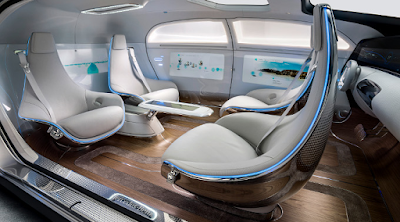 For more details on the F015 and further analysis of driverless trucks and cars, please see Driverless Cars and Trucks: Who Wants One? How Many Jobs Will Vanish?